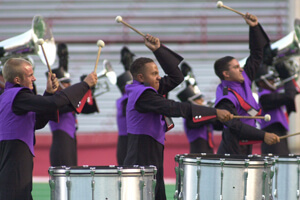 After not touring during the 2000 and 2001 seasons, the staff and management of Magic of Orlando wanted to bring the corps back in 2002 as a full-fledged Division I (World Class) corps. That classification had to wait until the end of the season as the corps was assigned a Division II tour. At the World Championships in Madison, Wis., they blew away the Division II & III competition with a 99.05 at the Division II Finals, then advanced through Division I elimination all the way to 11th place at the Division I Finals. (This meant the corps performed six nights in a row in Madison.) The corps roared back into competition in 2002, bringing on board a number of influential movers and shakers who had major successes with other corps. Among them were Blue Devils' Wayne Downey, who wrote the brass charts and BD's Dave Glyde, who penned the percussion charts. The Cadets' Jeff Sacktig wrote the drill. For the music, the staff chose Jerry Goldsmith's dramatic film score to "The Wind and the Lion," titling the show, "Desert Winds." Goldsmith was one of Hollywood's more prolific composers and is best remembered for such stunning scores as "Planet of the Apes," "Alien," "Patton," the three "Rambo" movies and five of the "Star Trek" films, among many others. The pounding of the tenor drums and marching bass drum, assisted by the seat-shaking thunder of eight large concert bass drums played by the snare drummers, kicked off the show with a forcible bravado. The rumbling of the drums backed up the bugle calls of the introductory fanfare of "Main Theme." Oranges and yellows on the flags captured the colors of a desert sandstorm. Goldsmith drenched his film score with exotic, open chords and voices that effectively captured the sense of the seemingly endless desert. The corps' arrangers had no problems conveying this impression on the field, incorporating quite a bit of sectional features to keep the tone colors changing with the blowing sands. The confidence of all the sections was particularly exciting to witness, as the members gave no indication that the corps was coming out of two years of inactivity. As such, "Desert Winds" was a most challenging and courageous show for the corps to take on. 2002 Magic of Orlando performance excerpt. "I Remember" demonstrated that the brass players could be tender as well as brash, milking the restrained soaring nature of the melody with a lot of peaks and valleys of dynamic contrasts. Vertically striped flags of muted brown and yellows and a longing male-female pas-de-deux scene made this one of those moments that helped draw fans forward in their seats without them even realizing it. The brass and percussion ended in a squiggle formation on the right side of the field, getting out of the way of the dance action. One of my favorite audio-visual moments of the year was in "Rasuli Attacks," an increasingly turbulent selection. The sopranos played a series of figures—picking up on the percussion mallet work—while walking toward the front sideline in a disintegrating visual form, individually out of step to the beat of the music. It was one of those moments I waited to witness with anticipation because it just worked so well, and I had no idea why. As the show drew to a close, the intensity was not allowed to fall off, keeping fans wondering if this corps spent the previous two years banking its energy to let it all hang out when the time came to finally come back to the field. The resurrection of Magic of Orlando made the 2002 Division I (now World Class) Finals one of the most exciting ever, as the corps was joined by Seattle Cascades and Spirit of JSU as one of the three corps that hadn't been in Finals the year before. (Until 2002, a turnover of one-quarter of all the corps in Finals hadn't happened since 1991 and hasn't happened since.) What also made the end of the season so exciting was the fact that only 1.95 points separated 10th place from 15th place in the Quarterfinals, adding to the drama of whether 11th place Quarterfinalist Magic of Orlando would really be able to hang on in the Semifinals. But when the corps moved up to 10th in Semifinals, the members assured themselves of a return trip to the Finals. It is easy to see their excitement and the relief in their smiles during the camera close-ups while they were being announced to the audience before their Finals performance. This week only, you can save on 2002 World Championship Audio and Video Performance Downloads on the DCI Fan Network. Buy the 2002 Magic of Orlando Video Performance Download. (Available this week only for $3.99. Regular price: $4.99.) Buy the Audio Performance Download bundle of all 12 Finalists from 2002. (Available this week only for $15.99. Regular price: $19.99.) Offer ends Monday, Jan. 2 at 8:30 a.m. ET.